Few things can ruin your day like the sight of a red, swollen pimple with its nasty looking whitehead in the center. Of course, a great skincare routine that includes a leave-on salicylic acid product along with a benzoyl peroxide product is fundamental to getting the problem under control. Even then, you might still end up with breakouts. What you do with that pimple right now to diminish its appearance and speed up how fast it goes away is as important as using the right products. In other words, don’t pop that pimple in haste! We’ve included a straightforward step-by-step guide to popping a pimple the right way, advice on how to keep more breakouts from showing up, and a few suggestions for concealing it afterwards. We’re sure you’ve read that you should never pop a pimple, and we understand the concern—you really can hurt skin if you don’t pop a pimple the right way…and if it’s not the right kind of pimple to pop. Over-squeezing and aggressive pushing, picking, or puncturing can cause serious damage that can last far longer than your zit would have—possibly permanently. But the truth is no one wants to walk around with an obvious, white-topped zit on their face. Leaving it alone is not something most people opt to do, anyway. The basic starting point is all in the timing: You need to know when the offending blemish is ready for its contents to be released. How can you tell? You’ll know it’s ready when you see a noticeable “whitehead” showing up on the surface, and the zit begins to feel as well as look swollen. Buy a comedone extractor. Beauty stores (such as Sephora and ULTA) carry them, as does Paula's Choice Skincare (Professional Blemish Extracting Tool). Cleanse your face with a gentle water-soluble cleanser. Do NOT use cold or hot water (that will aggravate the skin and make it redder). With the cleanser, lightly massage skin with a soft, wet washcloth to remove any dead surface flakes as this makes extracting the pimple easier. Take care not to over-scrub. Dry your skin gently. Do not use the comedone extractor or squeeze when your skin is wet because it's more vulnerable to tearing and creating a lingering sore. Center the comedone extractor’s opening over the pimple. Then gently (and we mean gently), and with very little pressure (and we mean very little pressure), push the comedone extractor down on the whitehead and move it across the bump. That should release its “contents.” And yes, this part can be gross. You may have to repeat this one or two more times, but that’s all, as going further can easily damage the skin and worsen the breakout. Remember to be gentle; the goal is to remove the whitehead without creating a scab or damaging the surrounding skin (scabs are not any better to look at than a pimple). After extraction, follow up with a 2% salicylic acid (BHA) exfoliant and a 2.5% benzoyl peroxide treatment. Combined, the salicylic acid and benzoyl peroxide help diminish the breakouts you currently have and prevent future occurrences by unclogging pores, lessening redness, and diminishing the environment blemishes grow in. 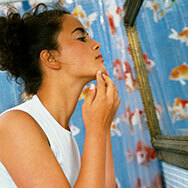 Apply these products to areas where you popped pimples and surrounding areas. If you find you have particularly stubborn breakouts a higher a 5% benzoyl peroxide product or speak to your health care provider about topical prescription options that can be used alongside over-the-counter acne products. Select a matte, neutral-toned liquid concealer that matches your skin tone exactly—avoid peach, pink, green, or ashy colours. A good option to consider is Smashbox’s 24 Hour CC Spot Concealer. After applying your foundation, use a concealer brush (synthetic hair with a flat, rounded point) or your fingertip and gently dab a small amount of concealer onto the center of the blemish, then blend softly outward, sheering out to the unaffected skin around the blemish. Optional: If you need more coverage, let the first layer of concealer set for about a minute before adding more, using the same technique. Reality check: The above steps can help hide the redness of a just-popped blemish, but the temporary raised bump that remains is something that can’t be hidden by makeup. Just do your best to conceal it, and then your best and try to forget about it.